200mm x 250mm hard cover, 192 pages, hundreds of profiles and many period black and white photos. Well set out and easy to read with some high quality profiles. None of the profiles are new and some are very, very inaccurate. Not a bad read but don’t buy it for the artwork alone. The text in "Luftwaffe Squadrons 1939-45 The Essential Aircraft Identification Guide" is set out with six major chapters beginning with ‘The Early Years: First Battles’, ‘The Mediterranean Theatre’, ‘War On The Eastern Front’, ‘Maritime Operations’, ‘The Defence Of The Reich’ and ‘The Final Months’. Each chapter is then divided into sub-chapters such as ‘The Pre-War Luftwaffe’, ‘Preparing for War 1935-39’, ‘Defeat of Poland’ and concluding in the Battles of France and Britton for chapter 1. 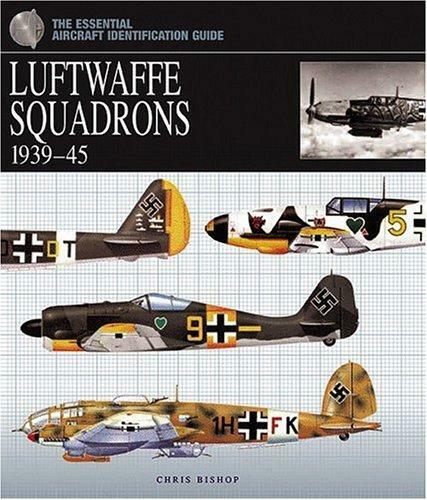 Spread among these sub-chapters is such interesting information in table form as the Organization of the Luftwaffe, Geschwader’s involved, types of aircraft and personalities plus numerous period photos and profiles of the aircraft with captions. This is where the major criticism comes in. Some of the profiles are particularly good with realistic shapes, accurate colours and very good detail, especially those by Iain Wyllie and others. The rest range from mediocre to really bad with inaccurate shapes and colours that are straight out of someone’s imagination. Worst of all, there is nothing new here, all have been seen before in many publications over the last twenty or thirty years and in every case, people have commented that they should be discarded, there are not even any artists mentioned in the credits. The text is well set out, quite readable, informative and interesting, the photos are clear and appropriate but the artwork, with some exceptions, is a total letdown.